This is the ONLY Pit Mat you need (you can buy more if you need more Mats for whatever number of tables you need it on). My take on this is if I would've tried this first, I would not end up having all these pit mats. The rubber type pit mats with magnets and slots on the rubber like the Team Durango pit mats are nice, but too small with uneven surface. This Pro Tek one is huge, even surface, no water/liquid leak through type material, "sticky" type material so your screws won't slip away that easily. 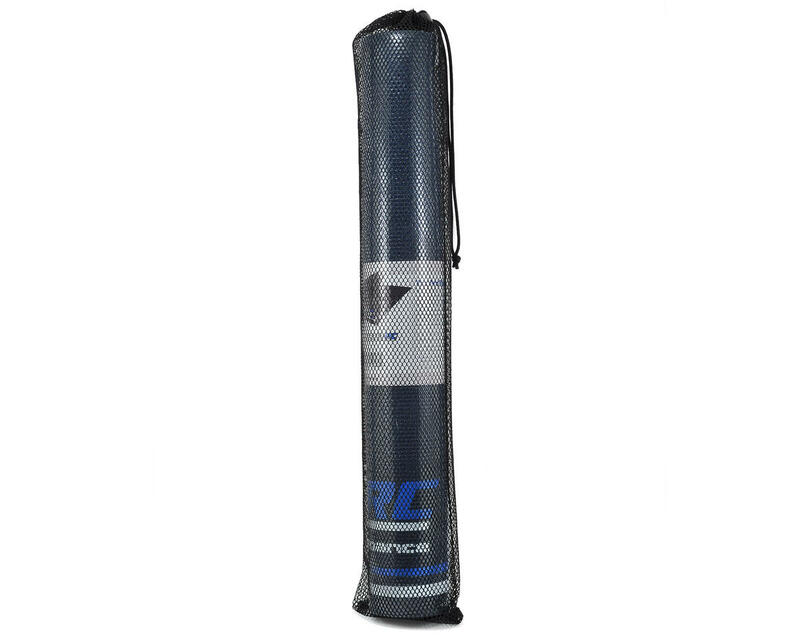 Basically what I'm saying is that this pit mat serves the same purpose as other rubber type pit mats with slots and magnets that hold screws but with a better design and material for the same purpose. And the surface is EVEN and the mat is MUCH BIGGER. The uneven surface of the Team Durango logos on the mat and the parts slots on the rubber mats get in the way in my opinion. As comparing with the BitterDesign type Pat "Towel"/"PAD" products, I don't know why they exist...maybe because there weren't that many like ProTek type pit mats around. Some people complained about the Mesh bag, don't listen to them, if you don't purposely rip it apart it's fine. I mean, it's a Mesh bag, you roll up your mat and put it inside...how easy is that to damage the bag? How in the world do you use your stuff? if you are impatient and don't want to spend the time to roll up your mat properly to fit into the bag, then don't use it, you won't like it if you are a person just want to shove everything into the bag without thinking. In that case, yeah, you would need a very durable bag and won't puncture or rip under heavy shoving abuse. You may ask, so..is the mesh bag really a tight fit even when you roll up your mat? The answer is NO, you don't have to roll it up as thin as a Spring Roll in order to fit the mat into the mesh bag, just roll it up in a good enough size and the rolled up mat will fit with ease. You just have to spend the time to roll it up! if you're not traveling with this and it's always on a table, this is not a concern then obviously. Ever drop a screw on the pit table from working on your vehicle and bounces to an unknown place? You can use this pit mat and the screws wont bounce off the table like without a pit mat. Looks Great! Seems to be great quality! Does what it is supposed to do! Can't ask for much more. Was concerned about putting heavy items on it that left an imprint in the foam, but it springs back to life in no time flat, even after days of something sitting on it. The mesh bag is a nice touch and I find it does the job just fine. A great size too! There is so much real estate to put things on. Very happy with this choice! This is a great pit mat. It is the same material as the Jconcepts mat, which I also own. It is a dark blue color however, not black. Just be aware of that. The material is an odd squishy no bounce material that has a memory aspect to it. The printed graphic on the mat seems to be high quality, and I have had no issues with delamination or the like yet. I have spilled motor spray, tire sauce, and WD40 on this mat with no signs of negative reaction or damage. The mesh bag that it comes with is extremely cheap, and the material drags and sticks to the mesh bag when you try to reuse it. I ended up just tossing the bag, as it was more trouble than it was worth. Not a big deal however, as most pit mats do not offer a pit mat anyways. 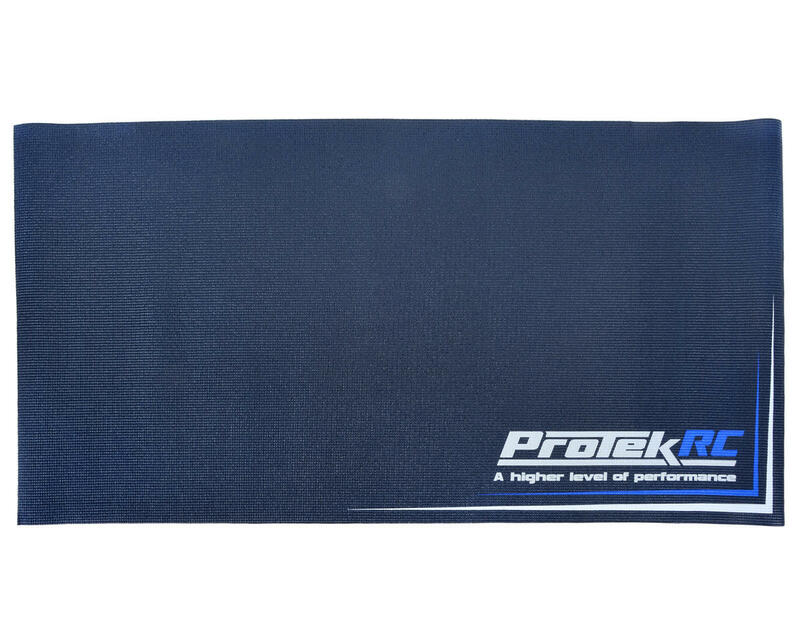 If you have other Protek stuff like a radio case and hauler bag, this mat really ties everything together nicely with a matching theme. as all protek rc goodies that I´been using, big bang for the buck! Great quality! great size.... I highly recommend this product. Nice pit mat. Easy to clean and fits perfectly on my table. The mesh bag is a nice touch too. Perfect addition to make your pit table look dialed!!! Great pit mat. The carry bag is convenient and makes for easy transport.